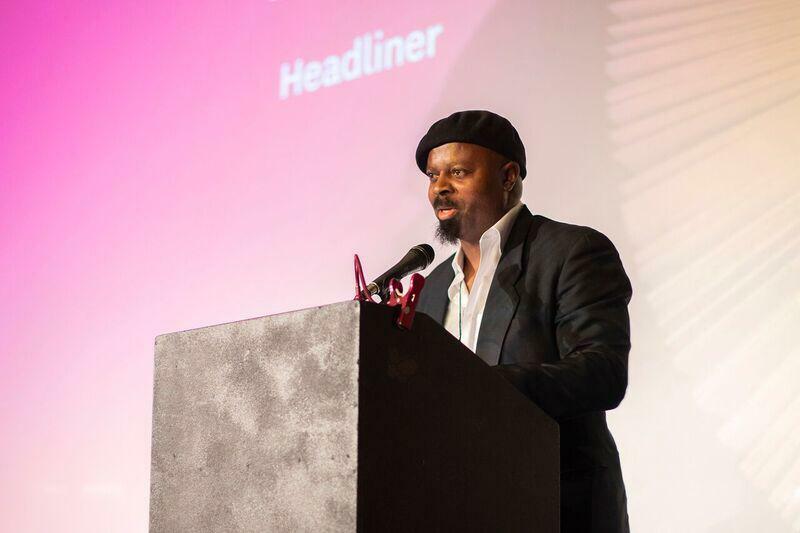 The keynote at the opening ceremony at the African Book Festival 2019 was given by festival headliner Ben Okri on April 4, 2019. The African Book Festival 2019, now in its second year, made its official entry at the Babylon Theatre in Berlin Germany on the evening of Thursday, April 4th, 2019. The evening started with a presentation by Stefanie and Karla, both of iKontinental, who are the brains behind the festival. They welcomed the packed audience to an evening of awesomeness that included video clips from the previous edition. They then invited this year’s festival curator Tsitsi Dangarembga on stage. Tsitsi who has been doing an amazing job curating the conference since she was announced last September would also welcome us and give a few remarks around the festival and its theme. She then invited the festival headliner Ben Okri to give his lecture. Ben Okri isn’t new to anyone who follows African writing today. While he has a very large body of work including novels, poetry collections, essay collections and more, the Nigerian’s most famous addition to the canon is The Famished Road which won the Booker Prize in 1991. The author in his signature beret would ask Karla to read a poem that would lead us into the keynote proper. With the poem dusted off, he went through his prepared remarks starting with the importance of immigration and how it basically saved the human race that is Homo sapiens. He went as far back as the start of the species as we know it in East Africa centuries ago and its spread across the world because of factors like the need for safety, change of environment and more. Humanity survived because of migration because to be human means to migrate. We are Homo Migratus. The movement across the world surface would enrich those who moved and those who stayed in many ways. He would remind us all that one of the biggest beneficiaries of migration for Africa is its literature which goes back thousands of years. This movement influenced everything from the oral traditions to the Book of the Dead of Ancient Egypt to the rich tradition of the novel in Amharic, to modern literature of anti-colonialism to the novels of Tutuola and Fagunwa, Achebe, Soyinka, Mariama Ba, Ngugi, and Buchi Emecheta. A large portion of writing in Africa in the last twenty years has been a literature of migration. Away from migration’s effects on literature, Okri would state that most people want to stay where they were but circumstances sometimes leave them no choice when life becomes unbearable. He averred that as long as those who reside in the global north continued destabilising those in the global south migration would continue. It was a brilliantly well-executed speech that he delivered that had the audience giving him a deserved standing ovation. With the speech having been delivered, he would then do a one on one chat with Dennis Scheck where he spoke about his work. The two last spoke when he won the Booker Prize twenty-seven years ago and their discussion would be quite well rounded. The matter of Okri being so badly off that he was basically homeless before he won the Booker in 1991 was brought out. The Nigerian explained that living on the street meant that he had to go within himself and produce his best work. This was because suffering either breaks you or pushed you deeper into what you love. He also spoke about his newest book The Escape Artist and how it came about and his influences starting with Plato and the now. That was a very enjoyable chat conducted by Herr Scheck. All images in this post were taken by Jörg Kandziora. Next Next post: Commonwealth Short Story Prize 2019 shortlist announced.